The Good: Pullman, Washington - It came down to the wire this week in a division matchup between Stanford Cardinal and Wazzu Cougars. The beginning of the game had the makings of a blowout as Stanford led 21 - 0 with under minute before the half, but then quarterback Connor Halliday, launched a 41 yard bomb that was pulled in by Brett Bartolone to put Wazzu on the scoreboard. After the half, the Cougars put together an impressive drive as they made it a one possession game until Stanford quarterback Kevin Hogan put a little drive of his own together that topped off with a 17 yard touchdown pass. The game went into the 4th quarter with Stanford still leading 28 - 14. The Cougars weren't about to go down without a fight as they scored on their next two drives while their defense held Stanford from scoring any points. The game was tied 28 - 28 with 1:21 on the clock as the Stanford Cardinal took the field and eventually moved into field goal range. With the clock ticking down, they kicked the game winning field goal that sailed through the uprights. A real heartbreaker for Wazzu, but a well needed respite for Stanford who continue their undefeated streak thanks to their kicker Jordan Williamson who gets an honorable mention this week for his clutch performance. The Middle: Tempe, Arizona - After a 2-1 start for the USC Trojans, they came out of their first bye week looking for a much needed win against the Arizona State Sun Devils. ASU struck first with a touchdown run by Taylor Kelley, but USC answered back with two touchdowns of their own, one from quarterback Max Wittek to star receiver Marqise Lee and the other from their NCAA leading rusher Dj Morgan. The Trojans led 14 - 7 until Kelley found Kevin Ozier for an 80 yard passing touchdown that tied the score up, but not for very long as Wittek connected on his own for an even farther 84 yard bomb that put USC ahead just before the half 21 - 14. The Devils came out flat in the 2nd half as they were stopped by the Trojan defense no matter what they tried, all the while the Trojan offense put more points on the board as Lee caught another touchdown putting the game that much more out of reach. It was 28 -14 in the fourth quarter and the Trojans were relentless as they handed the ball to Morgan and he took it 43 yards for another USC touchdown. Top that off with a field goal by Andre Heidari on the next drive and USC was up 38 - 14. The ASU coach fought hard to get back in the game, and with time on the Trojans side, they managed to find the endzone with a pass from Kelley to Alonzo Agweune. They went for the two point conversion to make it a two possession game, but failed and the game ended 38 - 20 USC. A losing streak has begun at ASU and no one knows when it may end as they face #2 Notre Dame next week. The Bad: Corvallis, Oregon - The Oregon State Beavers had home field advantage as they faced an undefeated Colorado Buffaloes team. The Beavers have been sliding in their division and practically live in this part of the newsletter as they have been featured here 3 times in a row now. All dramatics aside, the Beavers lost again as their coaching duties were taken by the offensive coordinator Danny Langsdorf while the head coach is away on what can only be described as personal business. The game was not as close as the score makes it appear Colorado's offense could not be stopped. They scored a touchdown in every quarter while their defense ground the Oregon State running game into dust as they only managed 53 rushing yards total. The one shining star for Oregon was their senior quarterback Cody Vaz as he threw for over 200 yards, but made a crucial mistake in the redzone which cost the Beavers early points. It was 24 - 0 going into the fourth as the Colorado backups took the field. When asked about this move coach Dayne replied, " ......our first team played so well that I took the fourth quarter to gage our underclassmen and see how they stacked up to Pac 12 competition with a lead to maintain. Suffice to say the front seven played well, but I was a little disappointed as our corners gave up a few too many big plays and allowed the Beavers to score twice. Now I know where I need depth on this roster and where I do not". He went on to point out the 2nd team scored a touchdown to put the game out of reach of a comeback. The game ended 31 - 15 with the Buffs continuing their win streak and the Beavers extending their losing streak. When OSU coach EyeoftheHawkeye will return is unknown, but one thing is certain, he is sorely missed. Game Of The Week: Palo Alto, California - #13 Washington vs #1 Stanford is your game of the week voted by the Pac 12 coaches. Freshman quarterback Cyler Myles has been called upon to start for UDub against the number one team in the nation and their Pac 12 leading passer, sophomore Kevin Hogan. Many believe it will be a battle of explosive offenses while this reporter believes it will come down to which defense makes the bigger plays. Both defenses have given up huge yards through the air. Only time will tell if the upset could become actuality or a delusion. 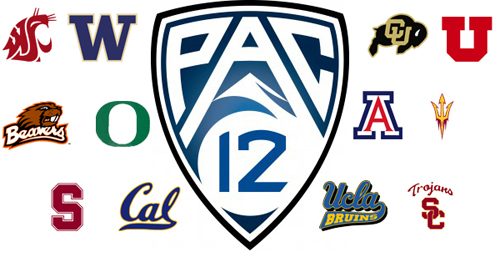 See you next week for the biggest game in the Pac 12 Division this year. Nice job bro that was a very nice read you filled in for Lax very well. I look forward to upcoming reports and thanks for taking the time to fill in for this!! Thanks man, not sure what game to make the week 7 game of the week yet. Congrats on your first win by the way. It looks like you transitioned well into that number one offense and kept their championship hopes alive. Thanks Lax I'm working on week 6 right now and I'll try to get it done before I head out to this party in 3 hours. Jettwing wrote: Thanks man, not sure what game to make the week 7 game of the week yet. Congrats on your first win by the way. It looks like you transitioned well into that number one offense and kept their championship hopes alive. Thanks Lax I'm working on week 6 right now and I'll try to get it done before I head out to this party in 3 hours. I was looking at the good like that ish didn't happen forgot that the game froze at the end. Still wanna see the film:( . I was in the bad column like 4 times in a row. I was gone though.